With Dynamic flexor around good, good anti-cracking properties, ozone excellent performance, anti-aging, heat resistance, oil resistance, abrasion-resistant characteristics. With synchronous belt drive is the use of tooth and tooth meshing with the impetus to pass a new type of transmission mode. With accurate synchronous transmission function, do not need lubrication and no slip, no pollution, less noise, transmission efficiency of 0.98, the speed ratio range up to 1: 10, allowing, wire speed up to 50 m / s, the transmission rate from several hundred watts to the hundreds of kilowatts, suitable for multi-axis drive. 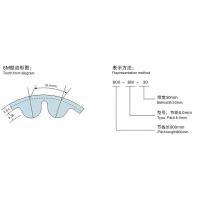 Neoprene synchronous belt widely used in the textile, automobile, chemical fiber, tobacco, paper, printing, chemical mechanical equipment; In recent years, mining and metallurgy, iron and steel machinery, medical equipment demand is growing.